The teenage years are an exciting time for teens who have a new sense of independence in the car, whether it’s as a new driver or a passenger in a friend’s car. It’s a time that can be both liberating and frightening for parents. The good news is our research confirms that parents can make a difference by talking with their teens about their expectations and setting some rules and boundaries. Teens tell us their parents are their best source for education and driver training. Parents, spend as much time as you can with your new driver to help them hone their skills. Every day, six teens are killed in a motor vehicle crash in the U.S. In fact, crashes are the leading cause of death for teens, ahead of all other types of injury, violence or disease. It’s never too late to be a good role model. Your son or daughter has been watching what you do in cars since they were small, and will model their good and bad behavior after what they see you do. Even if you’ve made mistakes, start doing the right thing today. Buckle up on every ride, every time; front seat and back. Make buckling up a habit starting when kids are young. 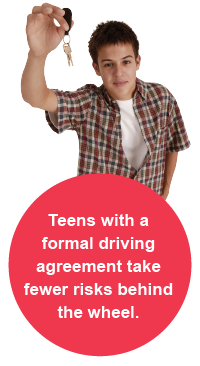 Make a formal agreement with your teen driver, setting clear expectations about your family rules.– Discuss different scenarios your new driver may encounter and what scares you about these situations. Define your zero-tolerance rules for driving, addressing speeding, alcohol and texting. Make sure your teen gets at least 50 hours of practice with an experienced driver in a variety of road conditions. Check your state law to find out what’s required, but don’t stop there if your child needs more time. Limit the number of passengers that is allowed in the car with your teen. The risk for a fatal crash increases as the number of passengers increases. Every child is different so set your rules based on your own assessment of your child. Encourage your child to speak up if a driver of any age isn't driving safely and makes them feel scared. Provide them with alternative plans to get home, just in case. For more tips on teen safety, please visit our Teen Safety Tips page. Find out what the Graduated Drivers License (GDL) laws are in your state. Our 2016 research report explores the number of cause of death for teens: car crashes. We examine what is causing these crashes and what parents can do to make a difference.